Are you a new RV owner, or want to become one? This New RV Buyer's guide will explain the differences between the many types of RVs and towable trailers so you can find the one that's right for you! You can also check out our Frequently Asked Questions (FAQs) to learn more about RVs, or meet other RV enthusiast and ask questions on our RV Forums. There are eight generally accepted types of recreational vehicles. Each type is listed below along with a definition and picture. Basic luxury coaches that are designed to be used by private individuals as a luxurious means of travel, having all the comforts of home, living quarters, kitchen, bath, and additional entertaining space with a touch of elegance found in 5 star accommodations. This class A motorhome is feature-rich and luxury-focused like the class A Gas motorhome below, making it ideal for both short trips as well as full-time living. 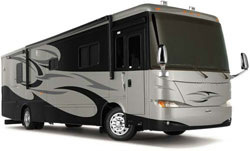 What sets this motorhome apart is the powerful, rear-mounted diesel engine. Ranging from 20 - 45 feet, typical diesel pusher floor plans will include slide-out room extensions, large storage bays, complete kitchens, and even washer/dryer. The type A motorhome, also commonly referred to as the conventional motorhome, is the largest, most luxurious of the motorized RVs -- a virtual "home-away from-home" on wheels, fully loaded and equipped for short trips, lengthy vacations and fulltiming. The type A is entirely constructed on a bare, specially designed motor vehicle chassis. Also commonly referred to as the van camper, the Type B motorhome is a cargo van that has been customized to include temporary sleeping, eating and bathroom facilities. 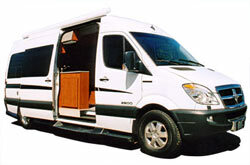 The type C motorhome, sometimes referred to as a mini-motorhome, provides the conveniences of a larger motorhome in a scaled-down version and at a lower price. The type C is built on an automotive manufactured van frame with an attached cab section. 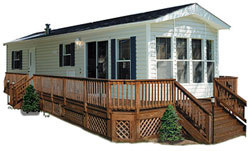 For those RVers and campers who like to spend the summer at their favorite campground near the lake, or for those who prefer to head South during the winter, park models (also referred to as park trailers) are often an economical and convenient alternative for long-term or seasonal camping. When set, park trailers may be connected to utilities necessary for operation of installed fixtures and appliances. It's built on a single chassis which is mounted on wheels. A unit loaded onto, or affixed to, the bed or chassis of a pickup, the truck camper is popular for backroad journeys, accessing remote locales and family recreational camping. A lightweight unit with sides that collapse for towing and storage, the folding camping trailer combines the experience of open-air tent camping with sleeping comforts, basic conveniences and weather protection found in other RVs. Do I need a special license to tow an RV? The vast majority of RVs require no special license to tow an RV. In some provinces, the very largest towable RVs may require a special driving test or written test for a different class of drivers license. 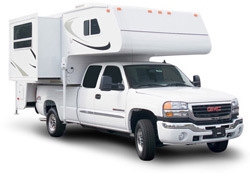 Regardless of size, a commercial drivers license is not required for towing a personal use RV. Towing skills are readily acquired. With a little practice, experienced drivers find it easy to learn to tow an RV. What type of vehicle do I need to tow an RV? Today's market features a large selection of tow vehicles -- conversion vehicles, SUVs, light trucks, most full-size and many mid-size cars -- with sophisticated engineering packages providing greater towing power, superior maneuverability and braking. What kind of identification do I need to enter Canada? U.S. citizens - Identification establishing citizenship is required such as an original birth certificate or a certified copy of proof of birth locations from a town hall, plus one photo ID card. A passport is not required but is ideal for identification. Temporary residents of the U.S. must carry a passport and may also require a visa depending on their citizenship.